Hotel Kingfisher has different kind of packages available for their guests for a short weekend trip; for example 1 night 2 days package or 2 night 3 days package. Usually people go for 2 nights – 3 days package, which includes luxurious stay in deluxe AC rooms along with breakfast and lunch or dinner at hotel Kingfisher Udaipur. There are many sight seeing places in and around Udaipur is included in this package. Usually people go for Jagdish temple, City Palace, Lake Palace, Lake Pichola, Jagmandir Palace, Bagore ki Haveli etc. One day you can also choose to go Eklingji, Nathdwara, Haldighati, Kumbhalgarh. A Glimpse Of Our Hotel Stay. 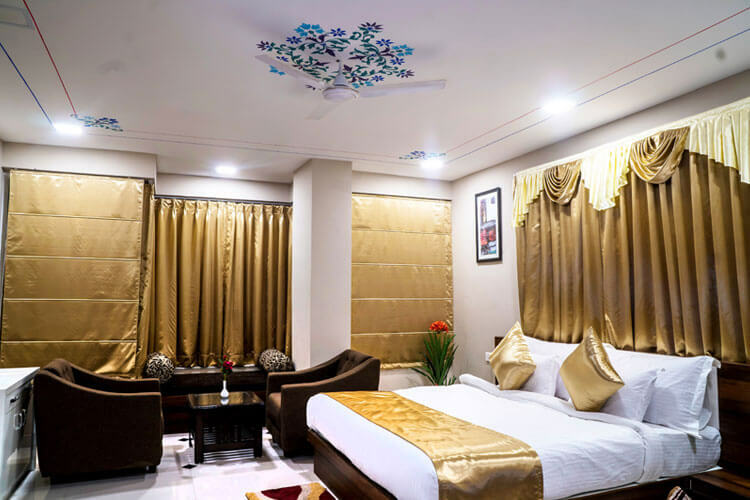 The wide choice of residential accommodation with the very affordable prices among any other Udaipur hotels rates, and the tranquil ambience like the resort make it a great place to enjoy a relaxing holiday in the company of your loved one. Its royal infrastructure adds to the beauty of the positive vibrations to the cool breeze in the surrounding atmosphere. Hotel Kingfisher Udaipur offers you the warmth, impeccable service and everything. It is a vibrant and lovely place to spend your holidays by Udaipur Hotel booking with your loved ones in utmost royal comfort with beautiful atmosphere around to breath in the cool aroma of the nature to refresh yourself. Plus it is situated near one of the most well-known landmark of the Udaipur, which is Marvel Water Park. You can enjoy your holidays with most amazing and comfortable stay and water park fun with your family. And so far it is most popular hotel near Marvel waterpark, Udaipur. Their prime mission is to completely delight and satisfy their guests. They are committed to making a difference every day. They provide “Unique” Experiences for “Unique” Individuals. They aim to meet the highest standards in location, accommodation, services. They put hospitality services on the highest level in order to satisfy the demands and expectations of guests. In short from each and every aspect this hotel is one of the best place to choose for your next trip to Udaipur.